For businesses now, not keeping up with change is dangerous. But adapting to change is actually a problem of all times. In 1809 Charles Darwin wrote, “It’s not the strongest of the species that survives, nor the most intelligent, but the one most responsive to change”. Given that the rate of change is now faster than ever, Darwin’s rule has never been more relevant. So what can CMOs do to seize change and set the example for the rest of their organisations to follow? One of the most crucial factors of success among leading companies today is their ability to provide a single consistent customer experience across all touch points. What does this mean for you and other leaders in your business? Simply this: don’t allow your org chart to be visible to customers, and don’t let it get in the way of successfully engaging with them. Team KPIs heavily affect customer experience. For example, many eCommerce departments are incentivised to drive online sales, while offline retail teams are incentivised to drive offline sales. But customers tend to mix online and offline channels in their journey, so their expectation is a seamless experience. “Creating a better customer experience is not a matter of finding the single best customer-centric KPI; it’s a matter of finding the set of KPIs that encourages departments to care about the whole customer journey rather than only the part of it that they touch,” explains Head of Programmes from Google Digital Academy, Joris Merks. Leaders in your business oversee the work of all teams, so you’re in position to urge the adoption of KPIs that drive alignment. Often, a related problem is that different internal teams focus on different parts of the customer journey and tend to make their technology choices without coordinating with other teams. The weaker the alignment, the worse the customer experience will be. “Technology choices that let you present a single voice to your customer and give you a single view of your customer should be made at a sufficiently senior level so that systems can be unified across all parts of the customer journey,” Joris advises. Take tagging for instance. As long as tags and other unique identifiers are aligned across departmental teams, they help tie fragmented data together so you can see the journeys of your customers. But if the team responsible for e-newsletters uses a different tag from the team that works on the website, you’ll never know whether a person was exposed to both. The data will make it look like you’ve been talking to two different people, which could lead you to treat a loyal repeat customer like someone who’s never bought a thing from you in their life! Tags are tiny and might seem insignificant – but they’re a powerful reminder that internal technology decisions must put your customers at the core. A frequent challenge found in many companies is the gap between business leaders and specialists. When it comes to technological developments, new solutions are so fragmented and move so fast that only specialists can keep up with them. That wouldn’t be a problem if specialists would speak using everyday language, but the reality is that many of them don’t. “Specialists tend to be the ones that understand in detail what technology does, however they are not always in a position to think beyond the boundaries of their own team,” Joris says. “That’s the job of the leader, but the leader doesn’t always have the right technical knowledge. If you can get specialists to work together with leaders, making unified technology choices becomes much easier.” The bottom line? Encourage specialists and leaders to speak to each other, bring tech and data specialists into leadership meetings more often, and don’t treat tech as a specialism in its own discrete silo. To be effective and useful, technology should permeate the organisation and be framed in language that’s accessible to all. Transformation isn’t a plan or programme; it’s a chain reaction of experiments, each small enough to start running now, but large enough to disrupt at least some old ways of working. Businesses today need an environment of experimentation in order to survive and thrive. In contrast, any business that is purely ROI based blocks transformation. Why? ROI from short-term goals is easier to quantify than for long-term goals, so looking only at ROI tends to skew the focus. Meanwhile, you can’t predict the ROI of something you’ve never tried, so it’s an approach that does little to stimulate truly adventurous thinking. In other words, if your employees perceive that the only way to convince you to try something new is to present a business case with a precisely calculated ROI, the net result will be that they always focus on short-term impact, never try something fundamentally new and never make bold investments in projects that require a learning curve – which basically means you can’t succeed in transformation. The solution? Remember that there's more to a business case than an ROI metric. Business cases can be based on quantifiable trends or on insights; if you can provide more flexibility in the format and rationale of a business case, people are more likely to invest in things that matter for transformation. To further drive the spirit of experimentation and make transformation happen, foster an environment of openness and create a culture that allows ideas to flourish. Hire people who can do many things and embrace change, give them as little structure as necessary while providing them with the tools and workplace that encourage them to connect with people and create their own fluid structures around the projects they own. Barriers are a key component of digital transformation. Barriers can’t be an excuse NOT to go through transformation – because they’re inherently part of it. The fact is, acts of digital transformation always add up to more work because transformational actions never fit existing processes or structures and you can almost never build on what’s already there. On top of that, there’s also more risk: if you do things the old way, you pretty much know roughly how things will go and what the end result will be. If you act in new ways, you don’t know whether you’ll succeed nor how big the impact will be. If you want your company to go through digital transformation, individuals within have to persist in their willingness to take on more work and more risk, because they believe it is the right way to go, because they derive a sense of purpose from it and because the company will reward them for their entrepreneurship. As a leader, what can you do to set this kind of scene? First, establish targets that help people focus on the future, including a really strong long-term vision with clearly defined challenges for people to work on. Secondly, set targets and provide tools that facilitate collaboration across silos. Encourage anyone to connect with anyone else regardless of hierarchy or position in the org chart. Finally, reward experimentation and a “test and learn” approach (including learning from failure). Because you can’t measure what you never tried, there need to be incentives for people to practise acts of innovation. Simple things like awards and bonuses can make a big difference by signalling to people that entrepreneurship is appreciated and prized. Before joining Google in 2010, Joris Merks-Benjaminsen worked in several media, advertising and research businesses. He now serves as European Head of Programmes for Google Digital Academy. His fresh thinking has won him prizes for Dialogue Marketer of the Year for 2012 and Best Marketing Book of the Year for his book “Online Brand Identity”. 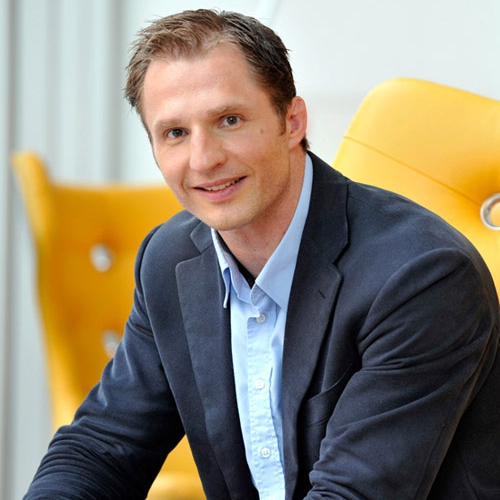 Joris was also nominated for Company Researcher of the Year and Cross Media Man of the Year in 2013. In workshops and through innovative digital learning formats, Google Digital Academy unites marketers, brand managers, strategists, creatives, data experts, digital specialists and company leaders to jointly craft their strategy for (digital) transformation.